In 1973, plans were made to publish a collection of musings by noted Lovecraft scholar Kenneth W. Faig, Jr., the man now credited with transforming research on Lovecraft and his circle from a haphazard collection of amateurs into a literary discipline unto itself. The publication never materialized, and Faig’s manuscript became the holy grail of scholarship, difficult to consult because of its very limited distribution, but well worth the quest. Early scholarship relied on Faig’s holistic approach to treating bibliographic, genealogical, biographic, and epistolary material to understand the full picture of Lovecraft as a man and as a writer. Faig’s fabled manuscript was the foundation on which future research was built. One need go no further than de Camp’s 1975 biography of Lovecraft to see Faig’s presence already influencing future research. 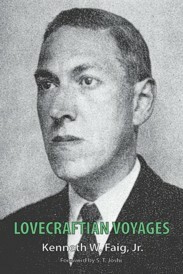 Lovecraftian Voyages is the eclectic amalgam expected of a man who is equally at home discussing Lovecraft’s annual income as he is pondering proper pronunciation of Cthulhu. This is a book for everyone interested in the external influences of Lovecraft’s life and how they shaped his career. Faig’s research remains the gold standard; as fascinating, relevant, and valuable as when it was pulled from a typewriter in the early 1970s. This updated 2017 edition has been prepared for Hippocampus Press by editors Christopher M. O’Brien and J.-M. Rajala, who have augmented the text with chapter divisions to assist readers in locating particular topics. Additional annotations are provided, distinguished from Faig’s notes. Finally, a thorough listing of works to date by and about Faig has been assembled, celebrating his unstinting and continuing devotion to the study of the Providence writer. S. T. Joshi has provided a new foreword. Lovecraftian Voyages. By Kenneth W. Faig, Jr. New York, NY: Hippocampus Press; 2017; ISBN 978-1-61498-205-0; paperback; 354 pages.